You are here: Home>People>Hubert Walsh, Billamore, Oughterard. 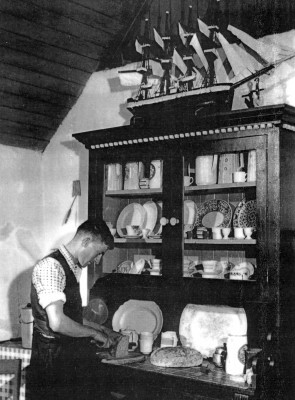 The ship on top of the dresser is 125 years old and was given to the young brothers Pat and Hugh Walsh, It was made by a Mr. Smyth, a Ship’s Carpenter. He was related to Cassie Sullivan of Glann. Mr. Smyth worked on the Galway to Clifden Railway Line and stayed with the Walsh family in Billamore.